Tues., June 5, 8:30 to 9:30 a.m.
Tues., June 5, 12:30 to 1:30 p.m.
Tues., June 5, 5:30 to 7:30 p.m. Weds., June 6, 8 to 9 a.m. Weds., June 6, 1 to 4 p.m. Thurs., June 7, 12:30 to 1:30 p.m. Thurs., June 7, 4 to 6 p.m.
Fri., June 7, 8 to 11:30 a.m.
No appointment necessary! Details here. Selection Committee Names Finalists for Marion County Judicial Positions - The Marion County Judicial Selection Committee (MCJSC) announced nine finalists to fill three upcoming judicial vacancies. See the list here. Business Builder: The Complete Package to Drive You to Success - Business Builder represents a tremendous value for Indy practitioners looking to gain clients and build their network—all crucial tools for attorneys at any point in their careers. This exclusive suite of referral and networking programs is available for as little as $90 per month. Read more. Revisions to Indiana’s Underground Storage Tank rules adopted by the Indiana Environmental Rules Board in January 2018 will be effective soon, likely in June or July of 2018. The rule revision is still under review by the Indiana Attorney General and Governor but will be effective 30 days after the revision is accepted for filing. The revised rule represents a shift in Indiana’s approach to regulation of USTs, as it incorporates most of the federal UST rules codified at 40 CFR Part 280 by reference, instead of containing the rule language within the text of Title 329 of the Indiana Administrative Code. Indiana retains parts of its own rules for delivery prohibition (the “red tag” program), investigation and corrective action, closure and financial assurance. The progress of the rule may be tracked here, referencing LSA Document No. 16-204. Five years ago, I left my job to start my own law practice. Having always worked for others, I was unsure of all of the issues I needed to consider and steps to take to open my own practice. Sure, I knew I needed a phone number, a computer and letterhead, but what business entity was best for my practice? What technology did I really need to have in place to successfully serve my clients? How would I create a budget, set my rate, or determine when I could hire staff? It would have been so nice if there was a comprehensive resource I could turn to for answers to my questions. Wasn’t it possible to find a roadmap of the topics I needed to consider when starting a practice? Five years ago the answer was no, but today, the answer is a resounding yes! Continuing in its support of solo and small firm attorneys, the IndyBar is pleased to launch its newest initiative, Practice Builder, a unique product that helps guide attorneys from start up to success. Practice Builder is driven by a robust website filled with resources to guide lawyers on everything they need to know about establishing a firm, managing and protecting a practice, and even succession and wellness planning. Night or day, attorneys can access tools such as podcasts, articles, forms, checklists, whitepapers and more to guide them step-by-step with the creation and operation of their legal practice. In addition, Practice Builder provides one-on-one connections with leading local solo and small firm lawyers and respected partners, helping attorneys build their networks and get support when they need it. Practice Builder even gives attorneys access to exclusive discounts on products and services that will power their firm to success. Most importantly, Practice Builder is affordable. All of these wonderful resources are available for a monthly fee of $19.99 for IndyBar members or $24.99 for non-members. If you’re looking to start your own practice, or even take your existing firm to the next level, Practice Builder is just what you need. So take a moment to look at Practice Builder and all it and the IndyBar has to offer. I know a lot of my questions would have been easily answered a few years ago, had I had access to a resource like Practice Builder. Your IndyBar provides everything needed to achieve success in the practice of law, and we stand committed to helping you accomplish your goals, whether you’re a new lawyer or contemplating retirement. You can learn more about Practice Builder at indypracticebuilder.com. Questions about this new product? Just contact Christina Kane at ckane@indybar.org. Who knows, maybe we can even get the caddy’s synchronized pool ballet going as the party gets rocking! The application period for the 2018-2019 Bar Leader Series is now open! The Bar Leader Series is the IndyBar’s leadership development program for young attorneys. This fast-track series empowers participants to make the most of their innate talents while emphasizing the importance of service to the community. Many notable IndyBar volunteers have graduated from the Bar Leader Series, including current IndyBar President James Bell. “When you’re a young attorney, your professional world sometimes feels like it only extends to the doors of your office,” says Bell. 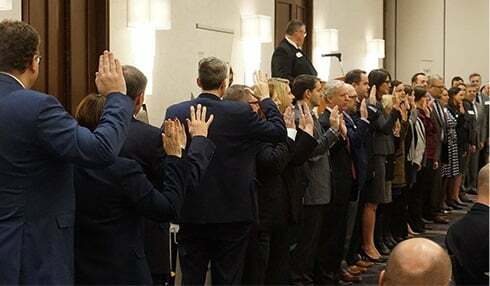 Committed to cultivating the next generation of leaders, the program was created in 2003 as the outgrowth of the IndyBar’s Task Force on Leadership Development and provides IndyBar member attorneys in their third to tenth year of practice with an opportunity to meet other attorneys in an environment where they can grow both professionally and personally. This program and these students are key to keeping the bar’s leadership strong and maintaining the bar’s value to the legal community into the future. “The Bar Leader Series helped me create great friendships and provided me with referral sources in areas in which I do not practice,” said Rebecca Geyer, graduate of the Bar Leader Series Class IV and current president of the Indianapolis Bar Foundation. This year’s class will begin with an icebreaker reception in August and a retreat at Waycross Camp and Conference Center in Southern Indiana Sept. 27-28, 2018. The series continues with monthly presentations for an entire afternoon for a nine-month period on a broad range of topics presented by local legal, political and business leaders. Class members will receive approximately 10 CLE credit hours during the nine-month series. When asked what’s new and exciting for the upcoming class, incoming Bar Leader Series Steering Committee chair and Indianapolis Motor Speedway’s Senior Corporate Counsel Jimmie McMillian had much to say but said this year’s focus is quite simple: listening. “In the past, we’ve talked and mentored a lot but this year, we want bar leaders to talk to each other. We want them to hear the lessons taught by the dynamic folks that we’re bringing in. They’ll have the chance to work with one another and provide feedback to us as well as ideas and suggestions they have on the topics that are presented,” McMillian said. McMillian claims the Bar Leader Series is a huge reason he’s had much success in his career. He graduated from the Bar Leader Series in 2007. “The Bar Leader Series has really accelerated and propelled my career to help me get to where I am today. It’s an exciting thing to know that we’re about to provide that to another group of exceptional attorneys in this community,” McMillian said. Do you think you’re the next bar leader? Apply now! The deadline is July 1, 2018. Application materials and additional information on the series can be found at indybar.org/barleaderseries.